brought by excessive spectrum aggregation as well. allocation protocols are not very applicable. and guarantee the spectrum efficiency at the same time. one among all the resources that satisfy user’s demand. And it makes the best use of resource in this way. demand, best-fit spectrum allocation strategy is implied. ance in part 4, we make our conclusions in part 5.
guarantee user’s demand in a contiguous spectrum level. with traditional continuous spectrum allocation strategy. channels when allocating spectrum resource. Spectrum aggregation works exactly this way . overall performance of the system as well. window from lower to upper frequency successively. by channel aggregation into consideration. considers different bandwidth requirements of SUs. efficiency and aggregation overhead into consideration. be occupied by one SU or PU. whole spectrum will be searched. Figure 1. Fragment fragments and allocation schematic. X. Y. LIU ET AL. aggregation at the same time. guarantee the number of channel that can be allocated. bandwidth requirements, which are sorted decreasingly. Steps of this algorithm can be simplified as follows. assignment can be divided into two stages. ments that are big enough for this SU’s requirement. The model of sliding window is shown in Figure 1.
spectively and the variables are re-generated in every run. Then we get the average values of simulation as follows. MixCASA algorithm only has a slight decrease. 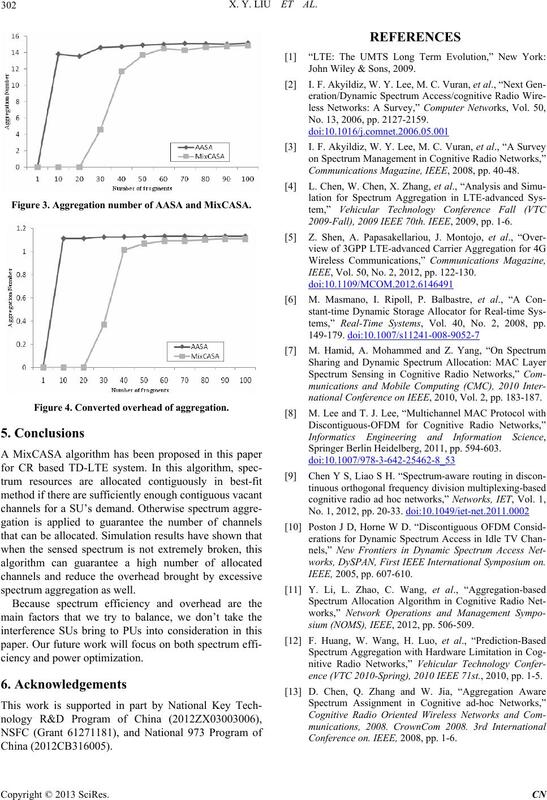 many times aggregation occurred during the allocation. a relatively high level at the same time. gregation when allocating sub-channels in different ways. No. 13, 2006, pp. 2127-2159. Communications Magazine, IEEE, 2008, pp. 40-48. 2009-Fall), 2009 IEEE 70th. 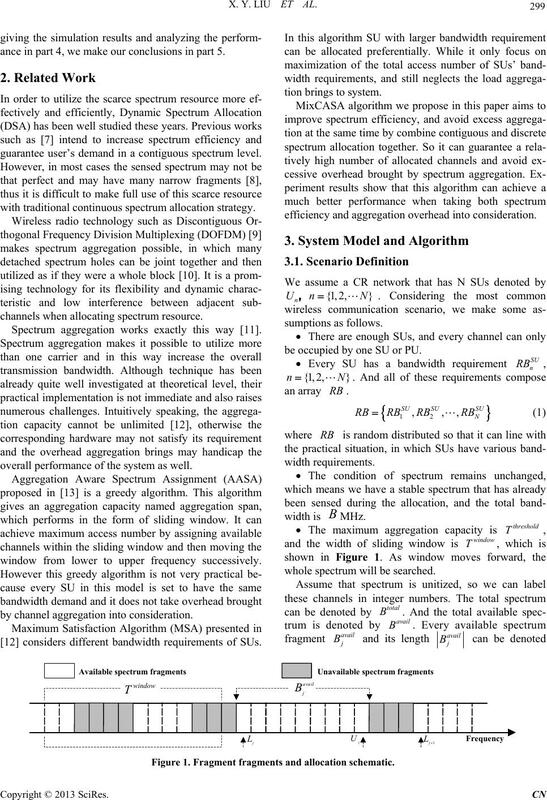 IEEE, 2009, pp. 1-6. Figure 3. Aggregation number of AASA and MixCASA. IEEE, Vol. 50, No. 2, 2012, pp. 122-130.
tems,” Real-Time Systems, Vol. 40, No. 2, 2008, pp. national Conference on IEEE, 2010, Vol. 2, pp. 183-187. Springer Berlin Heidelberg, 2011, pp. 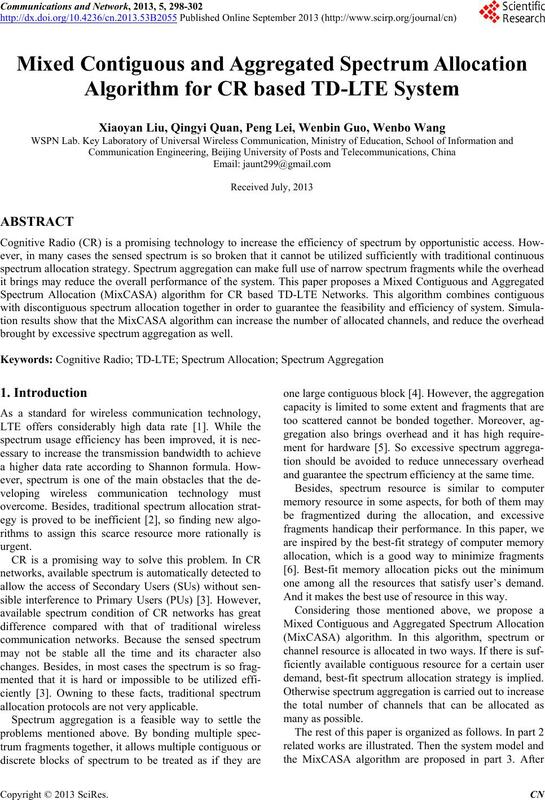 594-603.
works, DySPAN, First IEEE International Symposium on. sium (NOMS), IEEE, 2012, pp. 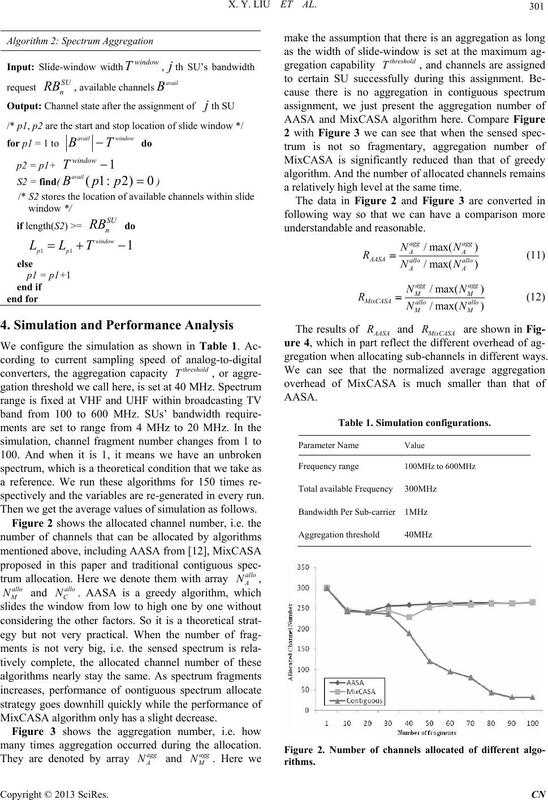 506-509.
ence (VTC 2010-Spring), 2010 IEEE 71st., 2010, pp. 1-5. Conference on. 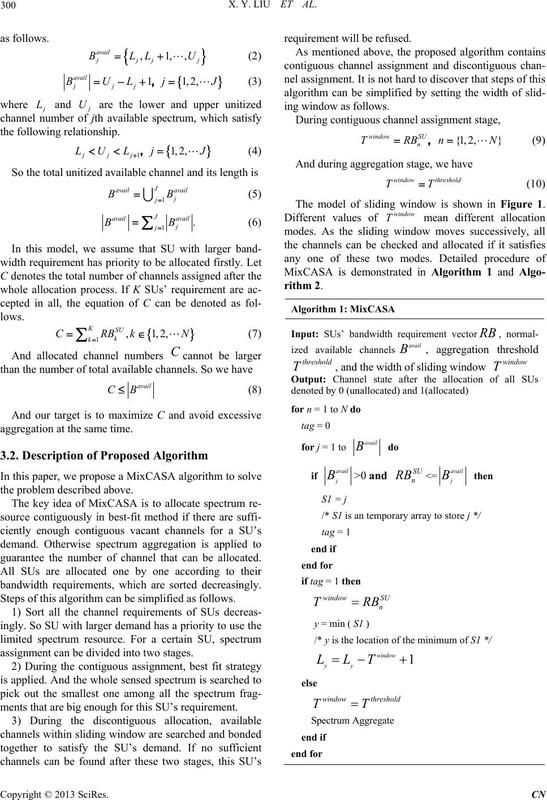 IEEE, 2008, pp. 1-6.